Posted on February 8, 2014	by J. Today, preparing for Cycle for Survival was very emotionally taxing. I kept thinking this is my time to finally honor George, but I couldn’t help but think this is my final goodbye to him. I’ve been pushing Cycle for Survival since a week after he died, and with the event finally here, what am I going to do? What else am I going to look forward to? It made me crazy this morning. I couldn’t stop crying because I didn’t want it to end, but I had been looking forward to it for so long. Luckily 2 of my close friends from home came out to breakfast with me and my worries floated away. When I got my bike assignment at the Equinox gym, I didn’t really think that much about it until I started really looking at the number. The picture I decided to put up on the dedication board was from one of our first dates and at the time I was 23 years old. The bike I was assigned was #23. Weird right? I loved every minute of today. From when I first arrived at Equinox to when it was time to leave. Being surrounded by those who are affected by cancer and understand the hardships that come with either battling it, conquering it, or losing someone to it, was possibly the most empowering experience I’ve ever had. 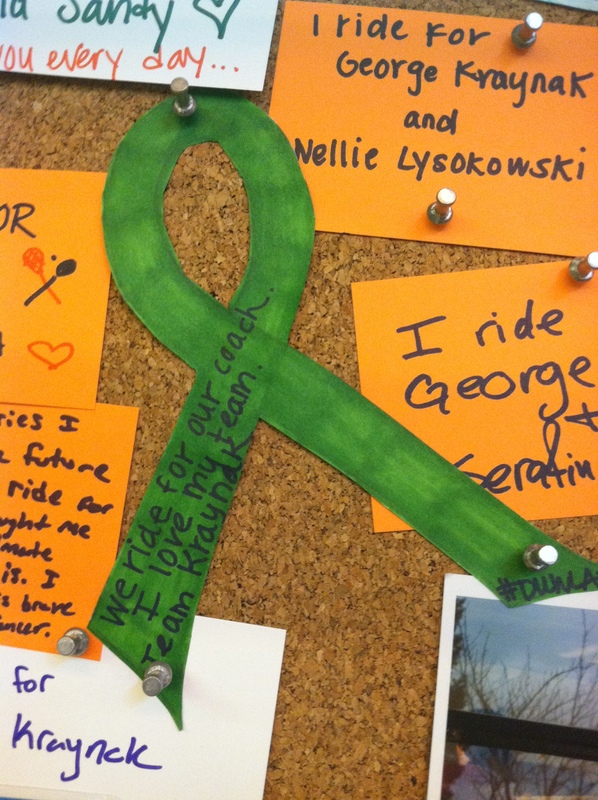 I met a woman who lost her daughter to cancer and when she asked what I was riding for, I told her. She looked me square in the eyes and said, “it’s so unfair.” And you know what? It IS unfair! She then continued to tell me that I remind her of her son-in-law because he became a widower at such a young age too. But because I was there honoring George, it gives George the “ability to keep fighting even though he’s not around.” And when she told me that, it was a perspective I’ve never heard before. 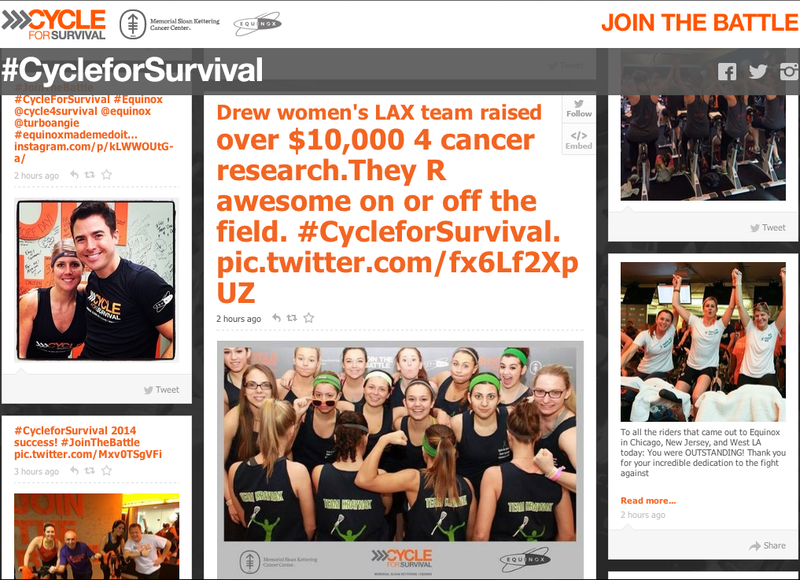 But that’s what Cycle for Survival is all about. Getting different results by doing unorthodox approaches. I hope the money raised goes to further treatments on liver cancers. I rode along side with my team, and they once again left me in awe. I had 2 pictures I wanted to post on the dedication board, but they came out with dozens! I was so happy I grabbed a pair of sunglasses because when I finally had time to start reading what they wrote, I did start crying. It was so moving and lovely. I feel so unlucky lots of times, but when I’m with my team I cannot help but think luck was on my side when these 21 girls came into my life. I love their support and enthusiasm and I couldn’t imagine where I would be without it. 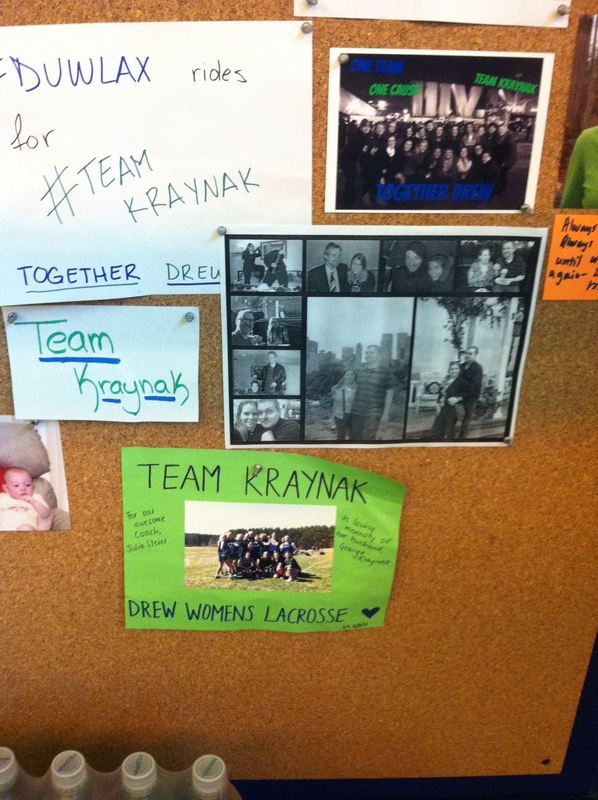 I love my lacrosse team and all the strength they provide me with. This entry was posted in Uncategorized and tagged cancer, college lacrosse, cycle for survival, cycling, equinox, family, grief, lacrosse, love, memorial sloan kettering, widow, Workouts, young widow. Bookmark the permalink.